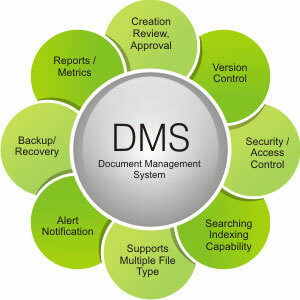 A document management system (DMS) is a system (based on computer programs in the case of the management of digital documents) used to track, manage and store documents and reduces paper. Most are capable of keeping a record of the various versions created and modified by different users (history tracking). The term has some overlap with the concepts of content management systems. It is often viewed as a component of enterprise content management (ECM) systems and related to digital asset management, document imaging, workflow systems and records management systems. The functions you can use these systems for include.